A new 24-unit condominium complex on the south shore of beautiful lake Cadillac. Weekend, extended weekend, weekly or monthly rentals available. Enjoy 2 and 3 bedrooms, gas fireplace, washer/dryer, dishwasher, refrigerator, stove, microwave, all dishes and cutlery, 2 full baths units – from 1000 to 1300 square feet. Private docks and boat launch, sandy beach, beautiful grounds and plenty of parking. 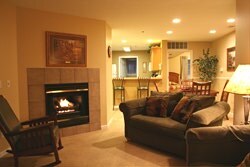 Sunset Shores is directly on the Cadillac snowmobile trail, bike path and minutes from area restaurants and shopping.